Henrique Capriles Radonski, opposition politician and governor of Venezuela’s Miranda state, disclosed a pressing reality of Venezuelan politics in an interview with the Spanish newspaper El País on June 13. When asked if the Venezuelan opposition is unified, Capriles, two-time presidential candidate who came close to defeating Nicolás Maduro in the 2013 elections, expressed confidence that the opposition is “going to be unified,” thus confirming the existence of intra-opposition divisions that have gradually chipped away at the fabric of the Mesa de la Unidad Democrática (Democratic Unity Roundtable; MUD), the electoral coalition of Venezuelan opposition parties. The purpose of this article is to trace and outline the sources of the divisions within MUD that have transformed it into a splintered opposition coalition plagued by party factionalism. Failure to resurface as a cohesive coalition may help the current government to retain a majority in the national assembly in this year’s parliamentary elections on December 6. This article will begin by illustrating the height of oppositional unity during the 2012 primary elections, locating some of the underlying tensions that later grew into palpable disputes during the opposition protests of 2014. After detailing the decay of unity from the 2012 elections to the present day, Capriles’ recent interview with El País will provide a deeper understanding of his intentions and help explain his shift away from more radical factions of the opposition. The disputes between these factions are rooted in strategy and logistics. Capriles, now a more moderate opposition member than some of his MUD allies, is focused on gaining power through constitutional measures, primarily in the form of a democratic electoral victory. Having moderated his critique of Chavismo, Capriles has sought to appropriate a quasi-Chavista image as he adjusts his rhetoric to appeal to poor and working-class Venezuelans, perhaps at the cost of alienating his former base of support within the middle class. Moreover, Capriles’ tactics compete with a more radical wing of the opposition, which once endorsed Capriles as MUD’s presidential candidate but whose tactics have included a call for “La Salida,” that is, for the “exit” of Maduro from office well before a constitutionally permitted recall referendum could be legally exercised halfway through the president’s term. Criticism of Chavismo has always emerged from both the Right and the Left. The Left opposition denounces the lack of trade union leadership in the country, governmental bureaucracy and corruption, and the inability thus far of Chávez’s model of communal councils to effectively challenge capitalism. However, the rest of the hemisphere often overlooks these criticisms, as opposition from the Right is continuously bolstered by the media power of its members and the political and material support of its friends in Washington. Since the election of Hugo Chavez as president in December 1998 and the subsequent creation of Venezuela’s current “Bolivarian” constitution through a constituent assembly and national referendum, rightwing opposition in Venezuela has decried the Bolivarian government as authoritarian or undemocratic. This opposition has harbored a number of different tendencies. Some sectors of the opposition on principle seek the restoration of a neoliberal economic model and a privatized oil industry; others, seeking a return to power, desire the return to dominance of former political parties Acción Democrática (Democratic Action; AD) and the Social Christian Party, Copei, which catered to the small oligarchy that was intertwined with the state oil company Petróleos de Venezuela, S.A. (PDVSA). Despite varying interests, a number of opposition political parties, the Venezuelan Federation of Chambers of Commerce (Fedecámaras), and a number of opposition media outlets were sufficiently unified during the overtly undemocratic coup in 2002 that displaced Chávez from power for three days. One can consider the 2002 coup a symbol of antigovernment unity within the old guard of the opposition; however, the popular uprising that helped restore Chavez to the presidency represented the loyalty of the military at the lower levels and the exceptional strength of Chávez’s base. The failure of the coup, along with many subsequent attempts to dislodge the government, including an oil strike (December 2002 to March 2003) and a recall referendum (2004), ultimately exposed an opposition that was too blatantly tied to the ancien régime to garner popular support. These failures of the antigovernment opposition to depose Chávez have led some opponents of the Bolivarian revolution to try a new approach to altering the political landscape in Venezuela—the most prominent figure in this new wave being Capriles. The consolidation of the MUD in January 2009 marked this shift and increased the visibility of two other notable actors in the current opposition: Leopoldo López, a Harvard-educated former mayor of Chacao who founded the party Voluntad Popular (Popular Will; VP) in December 2009 under MUD; and Marina Corina Machado, former member of the National Assembly. The paths of these three figures reveal a series of internal struggles that led to the opposition’s current inability to capitalize on the economic crisis. To supporters of the Venezuelan opposition, the primary elections in February 2012 represented the pinnacle of accordance between MUD’s prominent actors. Five candidates from the coalition ran, including Capriles, López, Machado, Pablo Pérez, and Diego Arria. Capriles ran on the platform of education reform, which he believed would rid the country of poverty, as well as insisting he would establish a moderate and diverse economy like that of Lula da Silva in Brazil. Despite the various political platforms crafted for the public, the opposition candidates were unified under a common vision for Venezuela, which was outlined in a document entitled “Guidelines for the Program of the Government of National Unity.” Signed by four out of the five MUD candidates (excluding only Arria) the leaked document provides an extended criticism of the current government and details the reforms MUD would pass if it were it to gain power. The proposed economic reforms were neoliberal in essence, such as creating an environment “conducive to private investment,” emphasizing property rights, and opening up the oil industry to “private actors.” Less ideologically driven reforms included a new gun control law and anti-corruption efforts. The document was a policy agreement between certain politicians in MUD, but it did not represent a truly unified anti-government movement. In fact, many smaller parties began to revoke their support for the opposition coalition after this document was released. Instead, the document only highlighted the class-based ideological homogeneity of the most powerful actors in MUD, namely Capriles, López, and Machado. The common interest in advancing the opposition’s cause among these three candidates persisted throughout the primary elections—and it was noticeable. The strength of their alliance was heavily underscored when López, already considered by many to be a rival of Capriles, withdrew from the race to endorse Capriles one month before the election. Capriles won in the primary but lost the October 2012 presidential election against Chávez by a significant 11-point margin. Despite the visible unity during parliamentary elections, Capriles’ strategy contained undertones of what would later grow into tensions within the opposition. Specifically, Capriles limited criticism of Chávez or Bolivarian socialism, and he vowed to maintain the missions, albeit without the adjunct political and ideological features, if elected. Capriles chose not to criticize Chávez on grounds of ideology or policy, only emphasizing that Chávez’s health problems kept him from walking and talking with the people (he was diagnosed with cancer the previous year). Capriles also tried to eclipse the president’s populism by parading himself as a youthful alternative to an ailing Chávez—but not to a dying Chavismo. Whether or not López and Machado recognized the implications of Capriles’ strategy in 2012 is unknown; however, it was widely acknowledged that Capriles was seeking to appropriate features of Chávez’s image, warranting the withdrawal of support from opposition leader Aldo Cermeno, a former governor and leader of Copei, who called Capriles a “photocopy” of Chávez. Nonetheless, Capriles’ blatant populism was undoubtedly an early seed that would later rupture the opposition’s unity. Chávez’s death in March 2013 was a pivotal event for MUD, which was hoping to see a subsequent change in Venezuela’s political tides. In April 2013, vice president Nicolás Maduro, chosen as Chávez’s successor, ran against Capriles, winning the election by an extraordinarily narrow margin of only 1.6 percent. The tightness of the election paired with Maduro’s general inability to imitate Chávez’s charisma and popularity instilled renewed confidence in Capriles and his followers in MUD. Machado demonstrated her support for Capriles as the face of opposition electoral politics by accompanying him on a trip to Europe and—without a single shred of evidence—accusing the National Electoral Council of Venezuela (CNE) of carrying out a fraudulent election. In a display of solidarity, Machado told Spanish online newspaper Libertad Digital that, despite losing the vote, “everyone knows Capriles is the legitimate president of Venezuela.” The CNE performed an audit of every ballot box and found that the elections were legitimate. However, the result of the audit was not significant to Capriles or Machado domestically; instead it brought a surge of international attention for Capriles and prompted a dialogue in the corporate media surrounding the mistakes and corruption of the Venezuelan government. 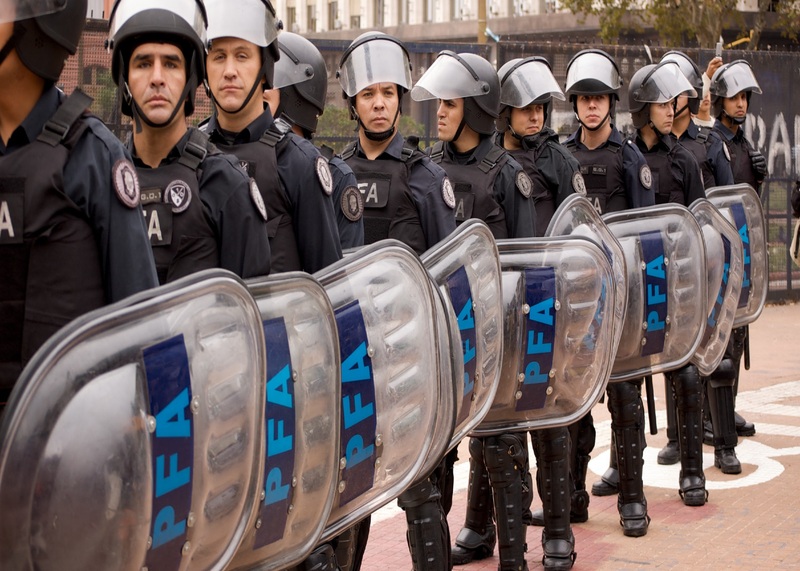 The major Latin American and Caribbean associations, however, generally backed the legitimacy of the April 2013 elections. The municipal elections on December 8, 2013 were the last instance of oppositional unity. Still claiming to have held the majority in April’s presidential election, Capriles had faith in his own popularity. Enhancing this confidence, President Maduro, who had inherited an already troubled economy, had not significantly improved Venezuela’s financial situation, which included (and still includes) shortages, inflation, and a vast black market for U.S. dollars. Beaming with confidence, Capriles declared that the municipal elections would be a plebiscite on Maduro and the United Socialist Party of Venezuela (PSUV), the party of Chavismo. However, Capriles’ confidence turned out to be a great show of hubris. Capriles inaptly stated that the plebiscite on Maduro reminded him of the one against Chilean military dictator Augusto Pinochet. The contradictions of this comparison were a mere reflection of Capriles’ miscalculation of his own impending political destiny. The outcome of the municipal elections was a loss for Capriles and MUD in more ways than one. First, the Great Patriotic Pole (GPP; Gran Polo Patriótico), the alliance of Chavista parties, won 256 municipalities, while MUD won only 81. Thus, Chavismo saw a victory of 72 percent, almost three quarters of the country’s municipalities. Moreover, the PSUV alone was the leading party, winning 240 of the 256 municipalities. Indeed, Capriles’ call for a plebiscite failed him; out of the total ballots cast, the PSUV won 49 percent, compared to 43 percent by MUD. The fact that the margin of Maduro’s victory had risen from 1.6 percent in April to six percent in December meant the opposition had undeniably lost the plebiscite. MUD’s defeat in December 2013 was the climax of opposition politics, as the regional elections were an ultimatum López and Machado placed on Capriles. Capriles’ multifaceted loss was also, in the eyes of hardliners, his failure to justify his inclination towards an electoral strategy, and the election marked a distinct rupture in the alliance between Capriles, López, and Machado. The executive secretary of the MUD resigned and the coalition fell into disarray. If the municipal elections of 2013 fostered a turning point in opposition politics and a break in oppositional unity, then La Salida (“the Exit”) was part of the fallout from this break. Beginning as a student movement and endorsed by López and Machado, La Salida called for the early exit of Maduro from power. More radical anti-government protesters, however, took to engaging in a series of violent protests and street barricades throughout the first quarter of 2014. The violence left 43 people dead, some at the hands of government forces. Although Capriles attended some of the protests, he did not endorse the movement, criticizing López and Machado for creating “unrealistic expectations” and urging the opposition not to engage in violence. Capriles’ lack of endorsement for La Salida was a concrete example of strategic disputes between Capriles and some of his MUD counterparts. Another comment by Capriles was even more telling. He stated that La Salida had mobilized the middle class and students, but “by necessity” the movement “must include the popular sectors,” referring to the poor and working classes that make up the majority of Venezuelans. In saying this, Capriles most likely knew that the popular sectors, which were deeply suspicious of La Salida, had been the steady base of Chavista power for over a decade. Capriles sought to tap into that massive power base, hoping to accomplish what Chávez had done: win an election by popular vote. A clear dialectical relationship exists between these two wings of the opposition: the more extreme López and Machado appear for advocating Maduro’s “exit,” the more compromising Capriles becomes. The prime example of this relationship is López’s arrest during the early stages of anti-government street protest. Charged with inciting violence during the protests, López was arrested on February 12, 2014 and was taken to prison, thus assuming the image, among his supporters, of a silenced political prisoner and martyr. Initially, Capriles remained in solidarity with López by boycotting a requested national dialogue with Maduro that would try to quell political unrest. Even though this boycott was a reaction to López’s imprisonment, by April 2014, López was still in jail as Capriles sat down with Maduro for a dialogue. 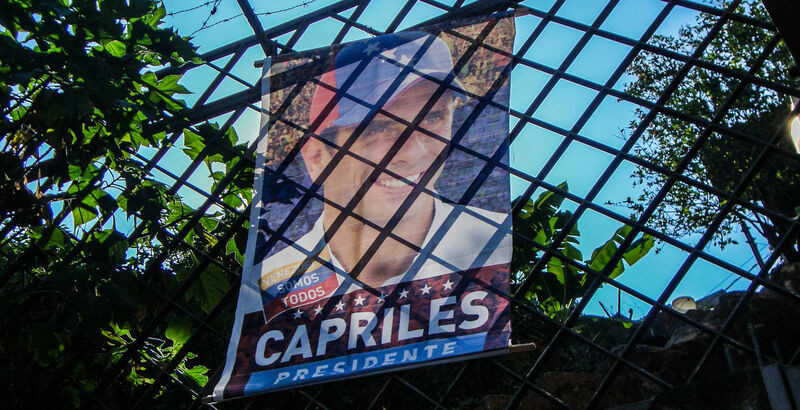 The outcome of Capriles’ change of heart, on balance, was probably good for his political image—which was becoming an increasingly populist one. To many viewers, Capriles’ participation in the talks seemed like a difficult compromise. Moreover, the strategy of violent street barricades was not a crowd-pleaser. According to a poll by Hinterlaces, 73 percent of Venezuelans interviewed rejected this strategy, and 78 percent of the same group believed that those who instigated the violence should be held accountable by authorities. 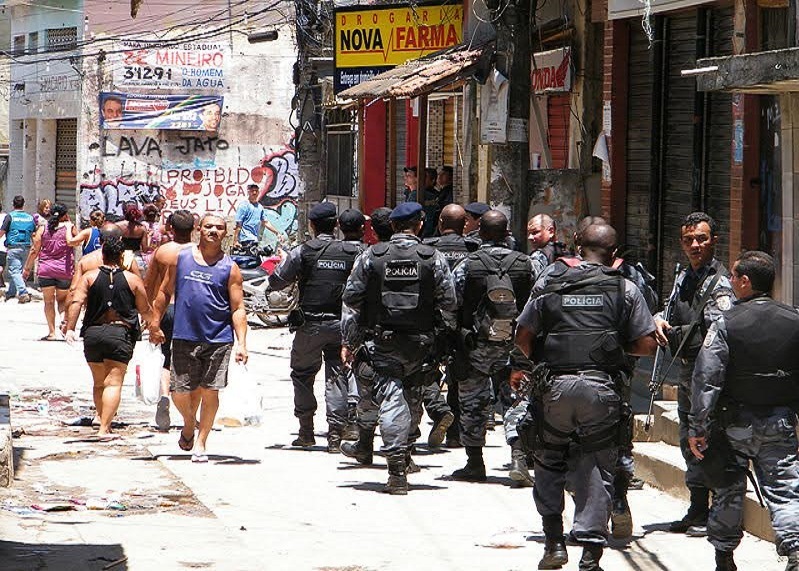 In addition, subsequent to the dialogue, tensions sharply reduced on the streets. In total, Capriles may have looked like the moderate and sensible populist politician whose performance could realistically surpass that of Maduro. More importantly, Capriles could overshadow Machado—who had been stripped of her seat in the National Assembly only weeks before the talks and was barred from holding office on July 15 of this year—as well as López—who remains in jail over a year after the dialogue started. The year 2015 has marked a deepening conflict. According to Bloomberg Business, Capriles called for a unified opposition in January, saying, “We may not coincide in how to confront the government, but we are in agreement that we want the country to change and the government to change.” Admitting that divisions within the opposition stem from disputes over strategy, Capriles went on to add that such change must come through constitutional means, upholding the same position that inspired his abstention from La Salida. However, Capriles’ plea for unification and constitutional tactics was in stark contrast with the concurrent agendas of López and Machado. With López still in jail and awaiting trial, López and Machado joined Antonio Ledezma, mayor of Caracas and fellow opposition politician, in signing a document entitled the “National Agreement for Transition,” which was to be released on February 12. Though the document itself is principally symbolic and arguably ambiguous in its implications, Ledezma’s alliance with López and Machado was significant, emphasizing the growing distance between VP and MUD. Additionally, the public statement came only 24 hours prior to government reports of a coup plot; Ledezma was arrested shortly after on charges of sedition and conspiracy. While the government has aired video, audio, and other evidence of the plot, some opponents of the government deny the conspiracy ever took place. Whatever the truth is surrounding the reported coup plot, it had the effect of widening the gap between Capriles and VP. Divisions were epitomized on May 30, when López began a hunger strike from prison and called for a peaceful street protest to demand the release of political prisoners. An estimated two to three thousand protestors convened (some estimates are significantly higher), gathering around Machado and López’s wife, Lilian Tintori, to display their discontent with the current government and their solidarity with Leopoldo Lopez. However, while Capriles said he planned to attend, MUD did not endorse this demonstration for reasons that were solely “logistical and technical,” as Executive Secretary Jesús Torrealba told CNN. MUD also released a public statement urging the opposition not to call for protests abruptly but to channel the population’s discontent into more organic political mobilization. Moreover, MUD emphasized the polarizing nature of this march and the damaging effect it would have on the outcome of the parliamentary elections, stating that the “road [to change] is electoral” and that “unity is mandatory.” The letter also included a backhanded criticism of López’ singular, martyr-like image, declaring, “not one organization nor one leader is more important than the people united and mobilized.” This letter and MUD’s abstention clearly and palpably indicated these divisions. Although Torrealba’s letter portrayed the march as divisive, it incited anger among opposition supporters who felt that MUD should have been less critical and supported the hunger strike. To revisit the interview with El País, Capriles revealed more than just his cognizance of disunity within the opposition and the necessity of reunification in order to “obtain an electoral victory.” He also expressed the culminating product of the dialectical struggle between two vying strategies, with Capriles’ opting for a more moderate and pragmatic approach and López and Machado pursuing a hard line that has marginalized them within the country. The interview was not the first instance of Capriles stressing the need to continue to enfranchise Venezuela’s poor and working classes (this dialogue was already seen during the months of La Salida), but it did indicate a bold evolution of Capriles’ stated intention to build a base of support among the popular sectors. This time, Capriles’ words went so far as to reveal a key component of his political strategy. When asked if he would negotiate with President Maduro, Capriles began to underline his political pragmatism, stating that “Chavismo is a political reality” that cannot simply be repudiated. Capriles then went on to stress a theme he launched during his last bid for president, declaring, “The Chavista people is one thing, and Maduro is another. In my opinion, Maduro does not represent the Chavistas.” Without associating himself with Chavismo entirely, Capriles deliberately separated his opposition to the Maduro government from an outright and total rejection of Chávez and Bolivarian socialism. Capriles apparently aims to tap into a fresher and larger base of power by appealing to the moderate opposition and independents, Venezuelans who are committed to the electoral process (and thus are alienated by the tactics of López and Machado), and even those who traditionally vote Chavista but are disillusioned with Bolivarian project and are not satisfied with Maduro’s handling of the economic crisis. Moreover, Capriles is well aware that his populism can never overshadow that of Chávez; as the Venezuelan political and social analyst and pollster Oscar Schemel of Hinterlaces points out, the culture and symbols of Chavismo now dominate the vast portion of Venezuelan society. Therefore, attempting to drive a wedge between Maduro and Chavismo is part of Capriles’ attempt to gain the support of the majority of Venezuelans and separate himself from traditionally anti-Bolivarian and anti-Chávez opposition figures. Capriles has definitely begun to execute this plan. Through the strategy of VP’s wing of the opposition—namely, agitation in the streets to call for an “exit” of Maduro from office—López and Machado have emerged as darlings of the Western corporate media and garnered support from a number of human rights organizations. López’s imprisonment has inspired a plethora of support in the form of Twitter hashtags and solidarity marches. However, the duo has failed to produce this enchanting effect within the Latin American nation, and they have yet to represent a viable option for Venezuelans who wish to see constitutional change through democratic procedures. By pursuing La Salida instead of waiting for Venezuelans to cast their ballots, the hardline right has painted itself into a political corner. In contrast, rather than becoming an international icon, Capriles has chosen to remain grounded inside Venezuela and make serious efforts to appeal to the popular mass of voting Venezuelans. Simultaneously, Capriles faces his own hindrances; he is stuck in limbo in terms of class-based support. His background—his origins from one of the wealthiest families in Venezuela and his early efforts to undermine the Bolivarian process—will always limit the possibility of poor and working-class Venezuelans identifying with him. Moreover, the middle class, who once supported Capriles and constituted his base of power during the 2012 primary elections, has watched the politician’s inconsistent transition into populism, and some of these constituents may no longer feel represented by Capriles, questioning whether or not he is a genuine threat to Maduro or Chavismo. Nonetheless, it is unclear how far Capriles has distanced himself from his neoliberal and conservative roots, especially in light of his economic plan released on July 14. Presenting the measures he would take to mend the economy, Capriles announced his plan to return inoperative expropriated businesses to their original owners (a regression from the point of view of the Bolivarian process), in addition to increasing worker salaries by 50 percent. In summary, neither Capriles and MUD nor López and Machado have yet to take advantage of the Venezuelan people’s mounting discontent. Divisions within the MUD have already begun to jeopardize the opposition’s political power, causing the coalition to lose positions in the National Assembly. Ricardo Sánchez, former opposition member and substitute legislator for Machado, is critical of the opposition and has recently joined a new, pro-Chavista party called the Alianza para el Cambio (Alliance for Change). On August 3, President Maduro welcomed Sánchez and two other former opposition activists onto the GPP’s ballot for this year’s parliamentary elections, appearing to use the ineptitudes of the coalition as a motive to recruit former opposition supporters, particularly youth and women, who have been “neglected and discriminated against” by MUD. With a strong showing by the PSUV in their primaries and revelations of new divisions with the temporary exclusion of Copei from MUD, the opposition’s prospects in the upcoming December 6 parliamentary elections are not very bright. Yet at the same time, the dwindling patience of the base of support for Maduro in the face of persistent shortages of basic goods could also be a game-changer. Venezuela is at a crossroads. As Oscar Schemel of Hinterlaces explains, “The balance of power now lies between Chavismo and the vote of discontent”—but discontent does not equate to a vote for the opposition. Featured Photo: Capriles sobre verjas. From: Julio César Mesa. Salas, Miguel Tinker. Venezuela: What Everyone Needs to Know. (New York: Oxford University Press, 2014),169.